This article is about the 1984 video game. For other uses, see Tetris (disambiguation). Tetris (Russian: Тетрис [ˈtɛtrʲɪs]; from "tetromino" and "tennis") is a tile-matching puzzle video game originally designed and programmed by Soviet Russian game designer Alexey Pajitnov (Russian: Алексе́й Леони́дович Па́житнов). The first playable version was completed on June 6, 1984, while he was working for the Dorodnitsyn Computing Centre of the Academy of Science of the Soviet Union in Moscow. He derived its name from the Greek numerical prefix tetra- (all of the game's pieces contain four segments) and tennis, Pajitnov's favorite sport. The name is also used in-game to refer to the play where four lines (the maximum simultaneous clearance number) are cleared at once. The game, or one of its many variants, is available for nearly every video game console and computer operating system, as well as on devices such as graphing calculators, mobile phones, portable media players, PDAs, Network music players, and as an Easter egg on non-media products like oscilloscopes. It has inspired Tetris serving dishes, and it has even been played on the sides of various buildings. While versions of Tetris were sold for a range of 1980s home computer platforms as well as arcades, it was the successful handheld version for the Game Boy, launched in 1989, that established the game as one of the most popular video games ever. Electronic Gaming Monthly's 100th issue had Tetris in first place as "Greatest Game of All Time". In 2007, it came in second place in IGN's "100 Greatest Video Games of All Time" (by 2019, it had moved down to 7th). In January 2010, it was announced that the games in the franchise had sold more than 170 million copies–approximately 70 million physical copies, and over 100 million copies for cell phones–making it the best selling paid-downloaded game of all time. Tetriminos are game pieces shaped like tetrominoes, geometric shapes composed of four square blocks each. A random sequence of Tetriminos fall down the playing field (a rectangular vertical shaft, called the "well" or "matrix"). The objective of the game is to manipulate these Tetriminos, by moving each one sideways and/or rotating by quarter-turns, so that they form a solid horizontal line without gaps. When such a line is formed, it disappears and any blocks above it fall down to fill the space. When a certain number of lines are cleared, the game enters a new level. As the game progresses, each level causes the Tetriminos to fall faster, and the game ends when the stack of Tetriminos reaches the top of the playing field and no new Tetriminos are able to enter. Some games also end after a finite number of levels or lines. Pajitnov's original version for the Electronika 60 computer used green brackets to represent blocks. Versions of Tetris on the original Game Boy/Game Boy Color and on most dedicated handheld games use monochrome or grayscale graphics, but most popular versions use a separate color for each distinct shape. Prior to The Tetris Company's standardization in the early 2000s, those colors varied widely from implementation to implementation. The scoring formula for the majority of Tetris products is built on the idea that more difficult line clears should be awarded more points. For example, a single line clear in Tetris Zone is worth 100 points, clearing four lines at once (known as a Tetris) is worth 800, while each subsequent back-to-back Tetris is worth 1,200. In conjunction, players can be awarded combos that exist in certain games which reward multiple line clears in quick succession. The exact conditions for triggering combos, and the amount of importance assigned to them, vary from game to game. Nearly all Tetris games allow the player to press a button to increase the speed of the current piece's descent or cause the piece to drop and lock into place immediately, known as a "soft drop" and a "hard drop", respectively. 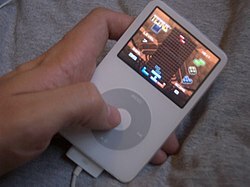 While performing a soft drop, the player can also stop the piece's increased speed by releasing the button before the piece settles into place. Some games only allow either soft drop or hard drop; others have separate buttons for both. Many games award a number of points based on the height that the piece fell before locking, so using the hard drop generally awards more points. Although not the first Tetris game to feature a new kind of Tetris, "easy spin" (see The Next Tetris), also called "infinite spin" by critics, Tetris Worlds was the first game to fall under major criticisms for it. Easy spin refers to the property of a Tetrimino to stop falling for a moment after left or right movement or rotation, effectively allowing someone to suspend the Tetrimino while thinking on where to place it. This feature has been implemented into The Tetris Company's official guideline. This type of play differs from traditional Tetris because it takes away the pressure of higher level speed. Some reviewers went so far as to say that this mechanism broke the game. The goal in Tetris Worlds, however, is to complete a certain number of lines as fast as possible, so the ability to hold off a piece's placement will not make achieving that goal any faster. Later, GameSpot received "easy spin" more openly, saying that "the infinite spin issue honestly really affects only a few of the single-player gameplay modes in Tetris DS, because any competitive mode requires you to lay down pieces as quickly as humanly possible." In response to the issue, Henk Rogers stated in an interview that infinite spin was an intentional part of the game design, allowing novice players to expend some of their available scoring time to decide on the best placement of a piece. Rogers observed that "gratuitous spinning" does not occur in competitive play, as expert players do not require much time to think about where a piece should be placed. Unsure of how to publish his game and fearful of the response of the Soviet regime if he did so, Pajitnov took the opportunity offered by Perestroika and gave the rights to the Soviet government for ten years. In 1988, the Soviet government began to market the rights to Tetris, following a promotional trip to the country by Gerald Hicks, the one-time United States champion of the game, through an organization called Elektronorgtechnica, or "Elorg" for short. At this time, Elorg had still not been paid by Andromeda, but Andromeda was licensing and sub-licensing the rights to the game. A different version of Tetris was originally released in late 1988 by Bullet-Proof Software (BPS) for several Japanese home computers as well as the MSX and the Family Computer in Japan, predating Nintendo's version. An unlicensed arcade version was released in South Korea, as well as an unlicensed Master System (titled Super Tetris (슈퍼 테트리스 Syupeo Teteuriseu)). By 1989, half a dozen different companies claimed rights to create and distribute the Tetris software for home computers, game consoles and handheld systems. Elorg, meanwhile, held that none of the companies was legally entitled to produce an arcade version, and signed those rights over to Atari Games, while it signed non-Japanese console and handheld rights over to Nintendo. Tetris was on show at the January 1988 Consumer Electronics Show in Las Vegas, where it was picked up by Dutch games publisher Henk Rogers, then based in Japan, which eventually led to an agreement brokered with Nintendo that saw Tetris bundled with every Game Boy. Rogers later stated, "Tetris made Game Boy and Game Boy made Tetris." 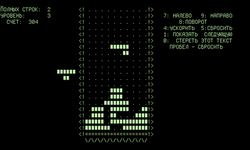 Tengen (the console software division of Atari Games), regardless, applied for copyright for their Tetris game for the Nintendo Entertainment System, loosely based on the arcade version, and proceeded to market and distribute it under the name TETЯIS: The Soviet Mind Game (with faux Cyrillic typography incorporating the Cyrillic letter Ya), disregarding Nintendo's license from Elorg. Nintendo contacted Atari Games claiming they had stolen rights to Tetris, whereupon Atari Games sued, believing they had the rights. After four weeks on the shelf, the courts ruled that Nintendo was the only company which had the rights to Tetris on home game systems. Tengen's TETЯIS was recalled with an unknown number of copies sold. The lawsuits between Tengen and Nintendo over the NES version carried on until 1993. The Tengen version of TETЯIS is considered rare. Nintendo released their version of Tetris for the Nintendo Entertainment System (NES), developed by Gunpei Yokoi. The NES version sold 8 million copies worldwide. Nintendo's NES version lacked the side-by-side 2-player option featured in Tengen's version. Nintendo Power reviewed this version in its November / December 1989 edition. The Classic Tetris World Championship commenced in 2010 and uses the Nintendo version of Tetris. On February 13, 2019, Nintendo announced and released a new version of the classic game called Tetris 99. Tetris 99 features a battle royale-style game mode where 99 players play in the same match. In addition to complying with the Tetris Guideline, this version of the game features a unique mechanic known as "badges." Badges lessen the severity of attacks received and amplifies the attacks sent. Players can gain badges by knocking out others who have them. In 1988, an arcade version was released by Sega in Japan for the Sega System 16 and System E arcade boards. It won the Japanese Gamest Award for Game of the Year the following year. Sega's arcade version was commercially successful in Japanese arcades. On Famicom Tsūshin's arcade earnings chart, it was number-three in August 1989 and September 1989. It rose to number two in October 1989, overtaking Namco's racing video game Winning Run. In 2014, in conjunction with the 30th anniversary of the series, Sega released Puyo Puyo Tetris, a multi-platform game that blends gameplay elements of both the Tetris and Puyo Puyo franchises. In 1996, the rights to the game reverted from the Russian state to Pajitnov himself, who previously had made very little money from the game. That year, The Tetris Company was founded, claiming to hold copyright registrations for Tetris products in the U.S. and taking out trademark registrations for Tetris in almost every country in the world. They have licensed the brand to a number of companies, and the U.S. Court of International Trade and the U.S. Customs have at times issued seizure orders to preclude unlicensed Tetris-like games from being imported into the U.S., though bulletins circulated by the U.S. Copyright Office state that copyright does not apply to the rules of a game. In mid-2006, and in late 1997, TTC's legal counsel sent cease and desist letters to Web sites on the basis of Tetris-type games infringing the "Tetris" trademark, trade dress, and/or "look and feel" copyright. Around 2009, TTC and Tetris Holding LLC brought legal action against BioSocia, Inc., on the grounds that BioSocia's "Blockles" game infringed on proprietary rights that were held by TTC and Tetris Holding LLC. On September 10, 2009, the legal case against BioSocia was resolved, with BioSocia agreeing to discontinue making the "Blockles" game available to the public. In May 2010, TTC's legal counsel sent cease and desist letters to Google insisting that 35 Tetris clones be removed from the Android Market. A US District Court judge ruled in June 2012 that the Tetris clone "Mino" from Xio Interactive infringed on The Tetris Company's copyrights by replicating such elements as the playfield dimensions and the shapes of the blocks. In addition, it was ruled that Tetris Holding LLC's trade dress had been infringed because "Mino" had replicated the form and brightly colored style of the Tetris Tetriminos and the higher-than-wide rectangular Tetris playfield. 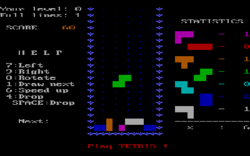 Tetris has been subject to many changes throughout releases since the 1980s. Newer Tetris games have focused on a trend of pace rather than endurance. Older releases such as Game Boy or NES Tetris offer records according to points. Since the meter for points is restricted to a specific number of digits, these games' records can be "maxed out" by an experienced player. The next big Game Boy release after Tetris, Tetris DX, in marathon mode—comparable to mode A in previous releases—allowed an additional digit for the point meter. Even so, players still maxed it to 9,999,999 points after hours of play. For The New Tetris, world record competitors have spent over 12 hours playing the same game. In Tetris DX and The New Tetris, the new modes sprint and ultra were added. These modes require the player to act under a timer, either to gain the most lines or points in that time. Releases like Tetris Worlds removed point records. This particular game kept records by how fast a certain number of lines could be cleared depending on the level. Critics of Tetris Worlds said it was flawed by virtue of the ability of a piece to hover over the bottom for as long as a player needs. There are many different modes of play added in recent years. Modes appearing in more than one major release include classic marathon (game A), sprint (otherwise game B or 40 lines), ultra, square, and cascade. The field dimension of Tetris is perhaps the least deviated among releases: almost always 10 cells wide by 20 high. Some releases on handheld platforms with small screens have smaller fields; for example, the Tetris Jr. keychain game has 8 by 12, and Tetris for Game Boy has 10 by 18. Traditionally, blocks spawn within the four most central columns and the two highest rows. The I Tetrimino occupies columns 4, 5, 6 and 7, the O Tetrimino occupies columns 5 and 6, and the remaining 5 Tetriminos occupy columns 4, 5 and 6 (or in some, especially older, versions, 5, 6 and 7). In some more recent games, pieces spawn above the visible playfield. In traditional games, a level-up would occur once every ten lines are cleared. In some newer games such as Tetris Worlds, the number of lines required varies upon each new level. After a level-up, points awarded are increased and the blocks fall slightly faster. For example, NES Tetris operates at 60 frames per second. At level 0, a piece falls one step every 48 frames, and at level 19, a piece falls one step every 2 frames. Level increments either terminate at a certain point (Game Boy Tetris tops off at level 20) or increase forever yet not in speed after a certain point. 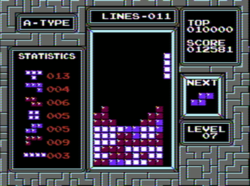 NES Tetris will level up in speed until level 29 (due to limitations of the game's engine, pieces are not capable of dropping faster than this), but tool-assisted emulation will show that the level indicator increases indefinitely—eventually leading to a glitch where the meter displays non-numeric characters. Modern games such as Tetris the Grand Master or Tetris Worlds, at their highest levels, opt to drop a piece more than one row per frame. Pieces will appear to reach the bottom as soon as they spawn. As a result, these games have a delay that lets the player slide the piece on the bottom for a moment to help deal with an otherwise unplayable fall speed. In some games, the hover time is regenerated after a piece is moved or rotated. Soft drops were first implemented in Nintendo releases of Tetris so that pieces would be able to drop faster while not locking as to slide into gaps. The other option is hard dropping, which originated in early PC games such as Microsoft Tetris, a game developed by Dave Edson and bundled with Microsoft Entertainment Pack. With hard dropping, a piece falls and locks in one frame. Newer Tetris games feature both options. Some games have their locking roles reversed, with soft dropping making the pieces drop faster and locking down, and hard dropping making the pieces drop instantly but not lock. Single direction rotation is an older restriction that has since been ruled out in nearly every new official release by the favor of separate buttons for clockwise and one for counter clockwise rotation. In traditional games, the unsymmetrical vertical orientation I-, Z-, and S-pieces will fill the same columns for each clockwise and counter clockwise rotation. Some games vary this by allowing two possible column orientations: one for counter clockwise and one for clockwise rotations. Double rotation—only seen in progressive clones such as Quadra and DTET—rotates the piece 180°. One of the features most appreciated by skilled players is wall kick or the ability to rotate the pieces even if these touch the left or right walls. In the NES version, for example, if a Z piece is "vertically" aligned and falling touching the left wall, the player cannot rotate the piece, giving the impression that the rotate buttons are locked. In this situation, the player has to move the piece one position to the right before rotating it, losing precious time. Proper implementations of wall kick first appeared in the arcade version of Tetris by Atari Games. Piece preview allows a look at the next piece to enter the field. This feature has been implemented since the earliest games, though in those early games, having the preview turned on made the score increase more slowly. A popular variant called "The Grand Master" eventually becomes so fast players have to use every second of time optimally, and it even has a mode dubbed "Invisible Tetris", where the blocks are only shown when falling – revealed when the game is over. Because of its popularity and the relatively simple code required to produce the game, a game with nearly the same rules as Tetris is often used as a hello world project for programmers coding for a new system or programming language. This has resulted in the availability of a large number of ports for different platforms. For instance, µTorrent and GNU Emacs contain similar shape-stacking games as easter eggs. Players lose a typical game of Tetris when they can no longer keep up with the increasing speed, or when the player can not find an appropriate solution to the Tetriminos they've been given, and the Tetriminos stack up to the top of the playing field. This is commonly referred to as "topping out." The question Would it be possible to play forever? was first encountered in a thesis by John Brzustowski in 1992. The conclusion reached was that the game is statistically doomed to end. The reason has to do with the S and Z Tetriminos. If a player receives a sufficiently large sequence of alternating S and Z Tetriminos, the naïve gravity used by the standard game eventually forces the player to leave holes on the board. The holes will necessarily stack to the top and, ultimately, end the game. If the pieces are distributed randomly, this sequence will eventually occur. Thus, if a game with, for example, an ideal, uniform, uncorrelated random number generator is played long enough, any player will top out. In practice, this does not occur in most Tetris variants. Some variants allow the player to choose to play with only S and Z Tetriminos, and a good player may survive well over 150 consecutive Tetriminos this way. On an implementation with an ideal uniform randomizer, the probability at any given time of the next 150 Tetriminos being only S and Z is (2/7)150 (approximately 2x10−82). Most implementations use a pseudorandom number generator to generate the sequence of Tetriminos, and such an S–Z sequence is almost certainly not contained in the sequence produced by the 32-bit linear congruential generator in many implementations (which has roughly 4.2×109 states). The "evil" algorithm in Bastet (an unofficial variant) often starts a game with a series of more than seven Z pieces. Modern versions of Tetris released after 2001 use a bag-style randomizer that guarantees players will never receive more than four S or Z pieces in a row. This is one of the "Indispensable Rules" enforced by the Tetris Guideline that all officially licensed Tetris games must follow. Maximizing the number of rows cleared while playing the given piece sequence. Maximizing the number of pieces placed before a loss occurs. Maximizing the number of simultaneous clearing of four rows. Minimizing the height of the highest filled grid square over the course of the sequence. To prove NP-completeness, it was shown that there is a polynomial reduction between the 3-partition problem, which is also NP-Complete, and the Tetris problem. Music A has become a well-known song in its own right, to the point that Level 20 in Tetris DS is based on this Game Boy version of Tetris and uses that theme. It is an instrumental arrangement of a Russian folk tune called "Korobeiniki", which has been covered by UK dance band Doctor Spin, US alternative rock band Ozma, Tokyo Ska Paradise Orchestra, Basshunter, Doctor P, and the German techno group Scooter on their 2007 album Jumping All Over the World. It was also sampled in "21 Concepts" by MC Lars. Music A and B are also remixed and arranged for Super Smash Bros. Brawl, and can be selected for the stage Luigi's Mansion, as well as being used in custom stages. The remixes were brought back in Super Smash Bros. for Nintendo 3DS and Wii U, with Music A once again playing in Luigi's Mansion in the Wii U version and being one of the bonus songs to play in the 3DS exclusive "Smash Run" mode, and Music B playing in "Wuhu Island" from Wii Sports Resort. The song has also been remixed for two dance games, under the name "Pumptris Quattro" in Pump It Up NX2 and "Happy-hopper" in Dance Maniax 2nd Mix. Ronan Murray has recorded an arrangement of the tune for pipe organ. The A theme was adapted by Australian musical group Flap!, with original lyrics added, on their debut album Flap!. Music B is an original track by Hirokazu Tanaka, the game's sound designer. Music C is an arrangement of Johann Sebastian Bach's French Suite No. 3 In B Minor, BWV 814, IV. Menuett – Trio. Music 1 in Nintendo's NES version is "Dance of the Sugar Plum Fairy", a tune noted to be scene 14c of act two of The Nutcracker, composed by Tchaikovsky. One song in the BPS and Tengen versions is the "Kalinka" (or Karinka, as referred in-game), a famous Russian song written by Ivan Petrovich Larionov. The victory song playing while the rocket blasts off is George's Bizet's "Les Toreadors" from Carmen Suite No. 1. 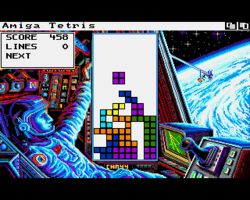 Atari's arcade version of Tetris, and its NES port by subsidiary Tengen have original pieces composed by Brad Fuller, as well as traditional Russian tunes also arranged by Fuller. According to research from Dr. Richard Haier, et al. prolonged Tetris activity can also lead to more efficient brain activity during play. When first playing Tetris, brain function and activity increases, along with greater cerebral energy consumption, measured by glucose metabolic rate. As Tetris players become more proficient, their brains show a reduced consumption of glucose, indicating more efficient brain activity for this task. Moderate play of Tetris (half-an-hour a day for three months) boosts general cognitive functions such as "critical thinking, reasoning, language and processing" and increases cerebral cortex thickness. Professor Jackie Andrade and Jon May, from Plymouth University's Cognition Institute, and Ph.D. student Jessica Skorka-Brown have conducted research that shows that playing Tetris could give a "quick and manageable" fix for people struggling to stick to diets, or quit smoking or drinking. Another notable effect is that, according to a Canadian study in April 2013, playing Tetris has been found to treat older adolescents with amblyopia (lazy eye), which was better than patching a victim's well eye to train their weaker eye. Dr. Robert Hess of the research team said: "It's much better than patching – much more enjoyable; it's faster, and it seems to work better.". Tested in the United Kingdom, this experiment also appears to help children with that problem. The game has been noted to cause the brain to involuntarily picture Tetris combinations even when the player is not playing (the Tetris effect), although this can occur with any computer game or situation showcasing repeated images or scenarios, such as a jigsaw puzzle. While debates about Tetris's cognitive benefits continue, at least some researchers view it as a milestone in the gamification of education. In 2013, The Tetris Company signed a contract with Hasbro to make a Bop It and a Jenga themed version of Tetris. The games were shown at the New York Toy Fair and Bop It Tetris was sold on Amazon.com in June 2013. Jenga Tetris is like Jenga but using Tetris shapes. Bop It Tetris is an audio game. It has several game modes including Marathon and Pass It. In the Marathon Mode, the player has four lives and has to complete the puzzles with the square lights. The game unit has three actions which are: "Slam It" which slams the top part of the device down, "Slide it", a screen which can rotate from left and right, and "Spin It", where the device can spin. If the player fails to complete the puzzle, the voice of Buddy Rubino will make a Santa Claus type laugh and will encourage the player with a comment such as: "Squares man! They're just squares!" or "Shapes are hard!" and Buddy will then say "Life lost" and one of the four squares on the top screen will disappear. After every stage is completed Buddy will tell the player with a comment such as: "Level up!" and there will then be a 45-second bonus round which the player can score two or more bonus points. In the Pass It Mode, it is the same as the Marathon mode except Buddy Rubino will say "Pass It" to let other people join in. Compute! called the IBM version of Tetris "one of the most addictive computer games this side of the Berlin Wall ... [it] is not the game to start if you have work to do or an appointment to keep. Consider yourself warned". Orson Scott Card joked that the game "proves that Russia still wants to bury us. I shudder to think of the blow to our economy as computer productivity drops to 0". Noting that Tetris was not copy-protected, he wrote "Obviously, the game is meant to find its way onto every American machine". The IBM version of the game was reviewed in 1988 in Dragon No. 135 by Hartley, Patricia, and Kirk Lesser in "The Role of Computers" column. The reviewers gave the game 4.5 out of 5 stars. The Lessers later reviewed Spectrum HoloByte's Macintosh version of Tetris in 1989 in Dragon No. 141, giving that version 5 out of 5 stars. In 1993, the ZX Spectrum version of the game was voted number 49 in the Your Sinclair Official Top 100 Games of All Time. In 1996, Tetris Pro was ranked the 38th best game of all time by Amiga Power. Entertainment Weekly picked the game as the #8 greatest game available in 1991, saying: "Thanks to Nintendo’s endless promotion, Tetris has become one of the most popular video games." Computer Gaming World gave Tetris the 1989 Compute! Choice Award for Arcade Game, describing it as "by far, the most addictive game ever". The game won three Software Publishers Association Excellence in Software Awards in 1989, including Best Entertainment Program and the Critic's Choice Award for consumers. Computer Gaming World in 1996 ranked it 14th on the magazine's list of the most innovative computer games. That same year, Next Generation listed it as number 2 on their "Top 100 Games of All Time", commenting that, "There is something so perfect, so Zen about the falling blocks of Tetris that the game has captured the interest of everyone who has ever played it." On March 12, 2007, The New York Times reported that Tetris was named to a list of the ten most important video games of all time, the so-called game canon. After announced at the 2007 Game Developers Conference, the Library of Congress took up the video game preservation proposal and began with these 10 games, including Tetris. In 2007, video game website GameFAQs hosted its sixth annual "Character Battle", in which the users nominate their favorite video game characters for a popularity contest in which characters participate. The L-shaped Tetris piece (or "L-Block" as it was called) entered the contest as a joke character, but on November 4, 2007, it won the contest. On June 6, 2009, Google honored Tetris' 25-year anniversary by changing its logotype to a version drawn with Tetris blocks – the "l" letter being the long Tetris block lowering into its place, seen here. In 2009, Game Informer put Tetris 3rd on their list of "The Top 200 Games of All Time", saying that "If a game could be considered ageless, it's Tetris". The Game Informer staff also placed it third on their 2001 list of the 100 best games ever. Electronic Gaming Monthly's 100th issue had Tetris as first place in the "Greatest Game of All Time". In 2007, Tetris came in second place in IGN's "100 Greatest Video Games of All Time". In January 2010, it was announced that the Tetris franchise had sold more than 170 million copies, approximately 70 million physical copies and over 100 million copies for cell phones, making it the best-selling paid-downloaded game of all time. In 1991, PC Format named Tetris one of the 50 best computer games ever. The editors called it "incredibly addictive" and "one of the best games of all time". Guinness World Records has recognized the game as being the most ported in the history of video gaming, appearing on in excess of 65 different platforms by 2011. Tetris has been the subject of academic research. Vladimir Pokhilko was the first clinical psychologist to conduct experiments using Tetris. Subsequently, it has been used for research in several fields including the theory of computation, algorithmic theory, and cognitive psychology. During the game of Tetris, blocks appear to adsorb onto the lower surface of the window. This has led scientists to use tetrominoes "as a proxy for molecules with a complex shape" to model their "adsorption on a flat surface" to study the thermodynamics of nanoparticles. Threshold Entertainment has teamed up with The Tetris Company to develop a film adaptation of Tetris. Threshold's CEO describes the film as an Epic Sci-Fi Adventure film and says that the story is so big, it'll be part of a trilogy. In 2016, sources reported on a press release claiming the film would be shot in China in 2017 with an $80 million budget. However, no 2017 or later sources confirm the film ever actually went into production. Tetris appeared in the 2010 short animated film Pixels, and in the 2015 movie Pixels inspired by the former. Ecstasy of Order: The Tetris Masters — 2011 documentary about the 2010 Tetris Championships featuring interviews with Pajitnov and Dr. Richard Haier. Game Over — 1993 book covering Nintendo history, including interviews with Alexey Pajitnov and others regarding Tetris licensing. Gerasimov, Vadim. "Tetris Story". OverSigma. Graham, Sarah (October 29, 2002). "Mathematicians Prove Tetris Is Tough". Scientific American. The creation of Tetris. BBC World Service. BBC. December 29, 2012. ^ "At 25, Tetris still eyeing growth". Reuters. June 2, 2009. ^ The Tetris saga. Retrieved August 24, 2007. ^ Pajitnov interview, G4 "Icons", ep. 305, originally aired on April 22, 2004. ^ a b c Gerasimov, Vadim. Original Tetris: Story and Download. June 10, 2007. ^ "HP 54600B Oscilloscope Easter Eggs". Eeggs.com. Retrieved November 12, 2008. ^ Perets, Abbi (February 22, 2010). "Tetris-inspired dishware brings the game to dinner". CNet. ^ Grossman, Samantha (April 6, 2014). "Watch a Giant Game of Tetris Played on a Philadelphia Skyscraper". Time. Retrieved April 7, 2014. ^ a b c d Tetris from the Top, April 6, 2006. Retrieved on April 28, 2007. ^ "Tetris Worlds for Game Boy Advance Review". Gamespot.com. September 5, 2001. Retrieved November 22, 2012. ^ a b Jeff Gerstmann; Ryan Davis (April 19, 2002). "Tetris Worlds for PlayStation 2 Review". GameSpot. Retrieved November 12, 2008. ^ "Tetris DS for DS Review – GameSpot". Gamespot.com. March 20, 2006. Archived from the original on August 5, 2011. Retrieved November 22, 2012. ^ a b c d e f g Phil Hoad (June 2, 2014). "Tetris: how we made the addictive computer game | Culture". The Guardian. Retrieved July 5, 2014. ^ Wagner, Roy (May 1988). "Puzzling Encounters". Computer Gaming World. pp. 42–43. ^ Boyes, Emma. Q&A Tetris creator Alexey Pajitnov Archived June 7, 2009, at the Wayback Machine. Retrieved October 31, 2007. ^ "From Russia with Litigation". Next Generation. No. 26. Imagine Media. February 1997. p. 42. ^ "The Wish List". Edge Presents Retro. 2002. ^ Director/Producer: Magnus Temple; Executive Producer: Nick Southgate (2004). "Tetris: From Russia With Love". BBC Four. Event occurs at 51:23. BBC. BBC Four. The real winners were Nintendo. To date, Nintendo dealers across the world have sold 8 million Tetris cartridges on the Nintendo Entertainment system. ^ Nintendo (February 13, 2019). "Tetris 99 Announcement in the 2.13.19 Nintendo Direct". Youtube. ^ "「ぷよぷよテトリス」の発売日が2014年2月6日に決定。「フィギュア付き3DS/3DS LLカバーセット」も同時発売". 4Gamer. Retrieved August 25, 2014. ^ Blue Planet Software, Inc. v. Pajitnov, 334 F. Supp 2d 425 (S.D.N.Y. 2004). ^ See, e.g., Copyright Registration Nos. PAu 1-214-036; PAu 1-214-035; PA 412–169; PA 412–170, among others. ^ See, e.g., Trademark Registration Nos. 1,753,062 (USA); 1,657,499 (USA); 1,742,325 (USA); 1,382,544 (UK); 1,382,543 (UK); 507644 (Taiwan); 498703 (Taiwan); 098,381 (Peru); 097, 244 (Peru); 266/36 (Saudi Arabia), among others. ^ See Luxury Int’l, Inc. v. U.S., No. 99-02-00093, Slip Op. 00-27 (Ct. Int’l Trade 2000), holding that Luxury violated Customs' administrative procedure; U.S. Customs Service Memorandum Order, ENF-4-02-RR:IT:IP 470343 GFM (December 19, 2000); U.S. Customs Service Memorandum Order, ENF4-02-RR:IT:IP 469107 GFM (July 31, 2000). ^ U.S. Copyright Office. Title 17, United States Code, section 102. Retrieved March 12, 2009. ^ U.S. Copyright Office. "Publication FL-108: Games." June 2008. Explanation of how 17 U.S.C. § 102(b) limits the extent to which copyright applies to the rules of a game. Retrieved June 2, 2009. ^ Aughton, Simon (July 11, 2006). "Tetris blocks Mac Quinn game". Expert Reviews. Archived from the original on October 6, 2011. Retrieved June 23, 2012. ^ Bednarz, Andrew James. "The Tetris Company's Activities". Archived from the original on January 23, 2009. Retrieved June 23, 2012. ^ a b "Resolution of Litigation Regarding "Blockles" Announced by Tetris Holding, The Tetris Company, BioSocia, Inc. and Charles Forman". BusinessWire. September 10, 2009. Retrieved February 18, 2011. ^ Paul, Ryan (June 2, 2010). "Google blocks Tetris clones from Android market". Ars Technica. Retrieved June 23, 2012. ^ Brown, Mark (June 20, 2012). "US judge declares Tetris clone 'infringing'". Wired UK. Retrieved June 23, 2012. ^ Casillas, Brian. "Attack Of The Clones: Copyright Protection For Video Game Developers". Loyola of Los Angeles Entertainment Law Review. 33 Rev 137 (2 (2013)): 166-167. Retrieved March 6, 2018. ^ "Welcome to Twin Galaxies". Twingalaxies.com. Archived from the original on June 4, 2008. Retrieved November 12, 2008. ^ "µTorrent Easter Egg: Tetris in µTorrent". Eeggs.com. March 16, 2006. Retrieved November 22, 2012. ^ poenn. "macosxhints.com – Play Tetris in Terminal via emacs". Hints.macworld.com. Retrieved November 22, 2012. ^ John Brzustowski. . Retrieved October 16, 2013. ^ Dr. Burgiel's Tetris Research Page, Explanation. Retrieved February 25, 2007. ^ Demaine, Erik D.; Hohenberger, Susan; Liben-Nowell, David (July 25–28, 2003). Tetris is Hard, Even to Approximate (PDF). Proceedings of the 9th International Computing and Combinatorics Conference (COCOON 2003). Big Sky, Montana. ^ "iTunes - Music - Flap!". Itunes.apple.com. Retrieved July 5, 2014. ^ "Tetris: Tengen (NES) - Videogame Music Preservation Foundation Wiki". Vgmpf.com. August 15, 2013. Retrieved July 5, 2014. ^ Richard J Haier; Sherif Karama; Leonard Leyba; Rex E Jung (2009). "MRI assessment of cortical thickness and functional activity changes in adolescent girls following three months of practice on a visual-spatial task". BMC Research Notes. 2: 174. doi:10.1186/1756-0500-2-174. PMC 2746806. PMID 19723307. ^ Haier RJ, Siegel BV, MacLachlan A, Soderling E, Lottenberg S, Buchsbaum MS (January 1992). "Regional glucose metabolic changes after learning a complex visuospatial/motor task: a positron emission tomographic study". Brain Res. 570 (1–2): 134–43. doi:10.1016/0006-8993(92)90573-R. PMID 1617405. ^ Holmes EA; James EL; Coode-Bate T; Deeprose C (2009). Bell, Vaughan (ed.). "Can playing the computer game "Tetris" reduce the build-up of flashbacks for trauma? A proposal from cognitive science". PLoS ONE. 4 (1): e4153. Bibcode:2009PLoSO...4.4153H. doi:10.1371/journal.pone.0004153. PMC 2607539. PMID 19127289. ^ GANDER, KASHMIRA. "Playing Tetris could help with weight loss and smokers' cravings, psychologists claim". The Independent. Retrieved February 24, 2014. ^ Luke Karmali (April 23, 2013). "A Study Find That Tetris Effectively Treats a Lazy Eye". IGN. Retrieved June 20, 2015. ^ "Video Game Treatment for a Lazy Eye". BBC News. April 4, 2012. Retrieved June 20, 2015. ^ "It has been 30 years since Tetris arrived in the U.S." eLearningInside News. January 29, 2018. Retrieved November 15, 2018. ^ "Tetris Mastertronic". Computer and Video Games. No. 92. June 1989. p. 74. Retrieved November 22, 2012. ^ "Reviews: Tetris". Crash. No. 50. March 1988. p. 10. Retrieved November 22, 2012. ^ "TETЯIS: Arcade Review". Sinclair User. February 1988. p. 13. Retrieved November 22, 2012. ^ Worrall, Tony. "Tetris". The Your Sinclair Rock'n'Roll Years. Archived from the original on April 27, 2012. Retrieved August 8, 2012. ^ "Gold Standard". The Def Gui to Zzap!64. Retrieved August 8, 2012. ^ "Tetris: Can MIRRORSOFT pack them in?". ACE. February 1988. p. 49. Retrieved November 22, 2012. ^ Weatherman, Lynne (July 1988). "Tetris". Compute!. p. 72. Retrieved November 10, 2013. ^ Card, Orson Scott (April 1989). "Gameplay". Compute!. p. 11. Retrieved November 10, 2013. ^ Lesser, Hartley; Lesser, Patricia; Lesser, Kirk (July 1988). "The Role of Computers". Dragon (135): 82–89. ^ Lesser, Hartley; Lesser, Patricia; Lesser, Kirk (January 1989). "The Role of Computers". Dragon (141): 72–78. ^ "The 189 Compute! Choice Awards". Compute!. January 1989. p. 24. Retrieved November 10, 2013. ^ Scisco, Peter (August 1989). "the Envelope, Please". Compute!. p. 6. Retrieved November 11, 2013. ^ "The 15 Most Innovative Computer Games". Computer Gaming World. November 1996. p. 102. Retrieved March 25, 2016. ^ CHAPLIN, HEATHER (March 12, 2007). "Is That Just Some Game? No, It's a Cultural Artifact". nytimes.com. Retrieved November 1, 2013. ^ Ransom-Wiley, James. "10 most important video games of all time, as judged by 2 designers, 2 academics, and 1 lowly blogger". Joystiq. Archived from the original on April 22, 2014. ^ "Fall 2007: The Great GameFAQs Character Battle VI". GameFAQs. Retrieved November 29, 2007. ^ "Google Features TETRIS Look For Game's 25th Anniversary". Electronic Arts. June 5, 2009. Retrieved September 25, 2009. Google will roll out the TETRIS-inspired design in 24-hour periods, starting first at 1:00 pm EDT in Japan, Australia, and New Zealand. From 6:00 pm – 7:00 pm EDT, the TETRIS-inspired design will begin appearing in Europe, Asia, Africa, and the Middle East. Starting June 6th, at 12:00 am EDT, the TETRIS-inspired design will be available in North and South America. ^ "25 Years of Tetris – courtesy of Tetris Holding, LLC". June 6, 2009. Retrieved November 22, 2012. ^ "IGN Top 100 Games of All Time – 2007". Top100.ign.com. Archived from the original on November 7, 2013. Retrieved November 22, 2012. ^ "» Tetris atteint les 100 millions de téléchargements payants (et une petite histoire du jeu) – Maximejohnson.com/techno : actualités technologiques, tests et opinions par le j". Maximejohnson.com. January 19, 2011. Retrieved November 22, 2012. ^ "Most ported computer game". Guinnessworldrecords.com. October 1, 2010. Retrieved June 7, 2013. ^ Mark J. P. Wolf (August 31, 2012). Encyclopedia of Video Games: The Culture, Technology, and Art of Gaming. ABC-CLIO. p. 642. ISBN 978-0-313-37936-9. Retrieved February 5, 2013. ^ Barnes, Brian C.; Siderius, Daniel W.; Gelb, Lev D. (2009). "Structure, Thermodynamics, and Solubility in Tetromino Fluids". Langmuir. 25 (12): 6702–6716. doi:10.1021/la900196b. PMID 19397254. ^ "'Tetris' Movie Planned as an Epic Sci-Fi Adventure". Movieweb. September 30, 2014. Retrieved September 30, 2014. ^ Brzeski, Patrick (May 17, 2016). "'Tetris' Movie to Be $80M U.S.-China Co-Production". The Hollywood Reporter. ^ Dickey, Josh (May 17, 2016). "Is this 'Tetris' movie for real? Too many key blocks are missing to be sure". Mashable. Retrieved June 24, 2018.